This photo of the month is from Plumtree Church and is of the South Aisle stained glass window behind the millennium altar. 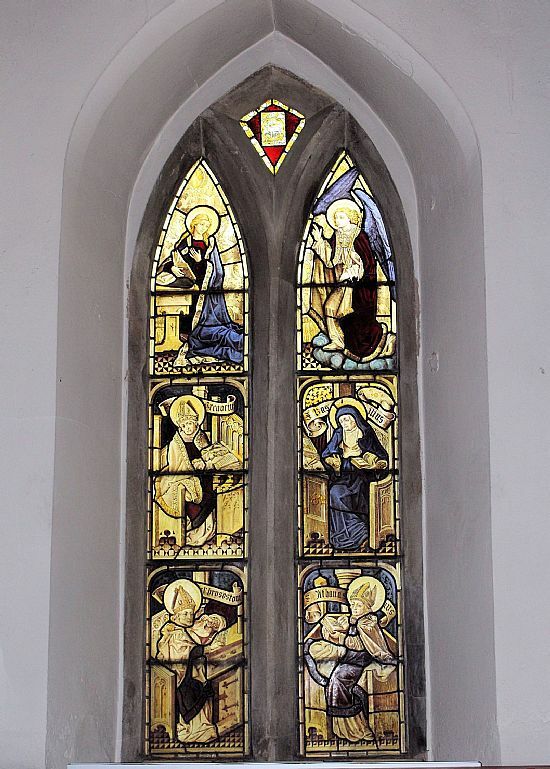 Dating from about 1880, the uppermost lights in this window depict the Annunciation, with Mary on the left and the Angel Gabriel on the right. Beneath these are figures of the four Greek doctors: Athanasius of Alexandria (spectacles on his nose), John Chrysostom of Alexandria (spectacles in his hand), Basil of Caesarea (spectacles on his desk, to the left of the inkwell) and Gregory of Nazianzus (no spectacles). These are based on figures in a 15th Century window in the Lorenzkirche in Nuremburg.